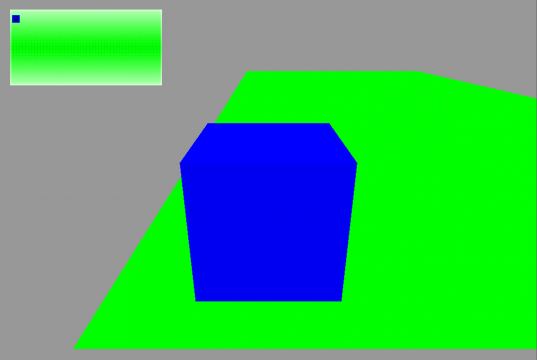 The first step is to create a plane by clicking on GameObject->Create Other->Plane. Resize it underneath your level, making it have the same size of your scene, not bigger or smaller, just enough to fit all of the elements inside it. Assigning a vibrant color to the plane is helpful when positioning it. To make things easier to understand, in this tutorial, the examples will use the plane as the only element in the level. Now, it’s time to start doing some math to obtain some values that will be important for the scripts and for the map’s background to be correctly rendered. Open the plane at the Inspector and divide the X Scale value by the Z Scale, this way, obtaining the plane’s width/height ratio. The next step is to launch Photoshop or any image editing software. Make an image that will be the background of the map with the same ratio and customize it any way you see fit. The size doesn’t matter, as long as it is smaller than the screen resolution and the ratio is the same as the one calculated above. This image is going to be 300x150, meeting the 2:1 ratio requirement. Besides the background, this example has only one extra element to be displayed on the map. 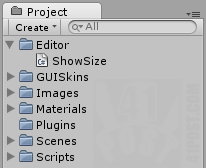 The 'ShowSize' script inside the 'Editor' folder. Open this script window by clicking on Windows->Show Size. A new window will pop up. Select the plane on the scene, and Show Size script will display its size in the X, Y and Z axis. Write down these values as they are going to be important to the scripts explained below. 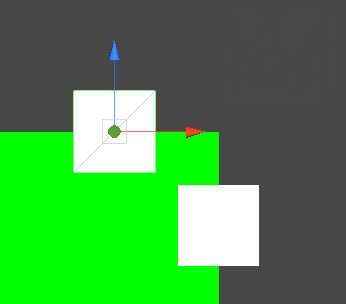 With these values stored somewhere, create a new Cube game object (GameObject->Create Other->Cube). Align its center at each of the plane’s edges, writing down X and Z coordinates. These values are also relevant to the code. Center the cube at the 4 edges of the plane. Take note of its position. The above code should be self explanatory. Line 12 pushes this GUI to the bottom of the GUI layers. Line 15 starts a new GUI group, that will render the map 20 pixels away from the top left border of the screen. 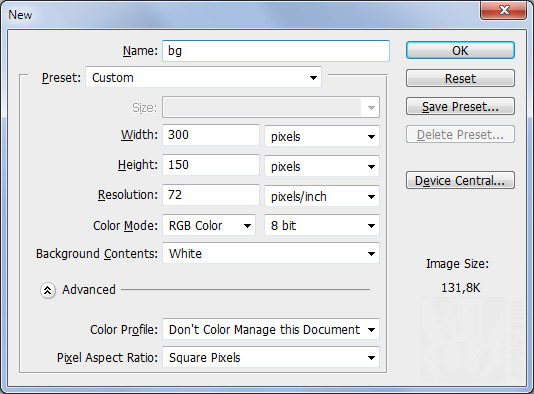 The GUI group must have the same size as the GUI background image. 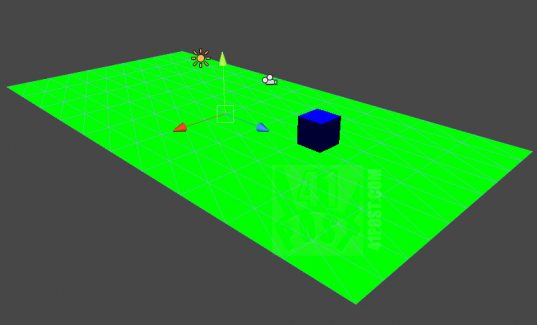 This other script will display, on the map, the location of the Game Object it’s attached to. This script is a little different since it uses the game object’s X and Z position to draw it’s representation in the overview map at the correct position. Line 24 makes it all happen. The X and Z positions are multiplied by 15 because it corresponds to the map background’s image width (in pixels) divided by the plane’s size at the Z axis, so: 300/20 = 15. It’s the map image/plane ratio. 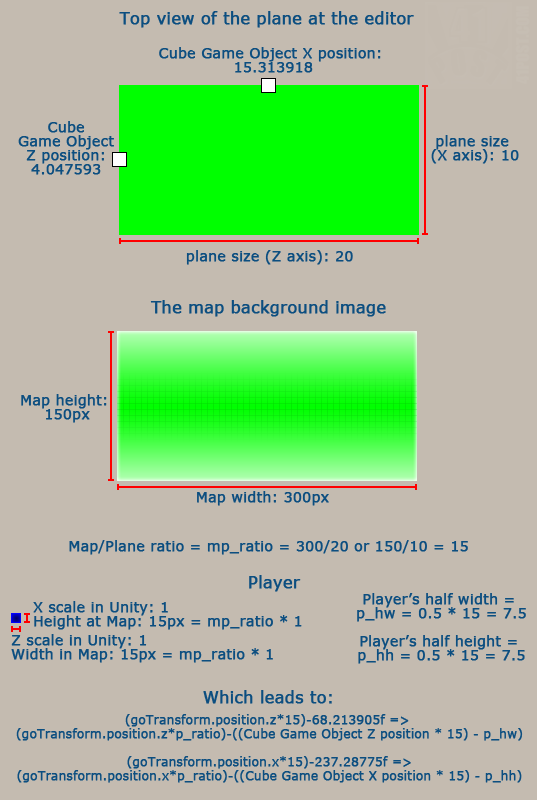 The same value can be found by multiplying the map background’s image height (also in pixels) divided by the plane’s size at the X axis. Image that explains the values found on line 24. The map, at the top left corner. Thanks for another GREAT tutorial, this one is going to be very helpful to me in the near future,thanks! I hope it was clear enough. Thanks for the feedback! Thank you for this tutorial ..